The company WMS Gaming developed a video-type slot that among its features you can see unusual six reels, as the most common number of reels is five and the most unusual, even more than the six, are slot games of seven rotating reels. 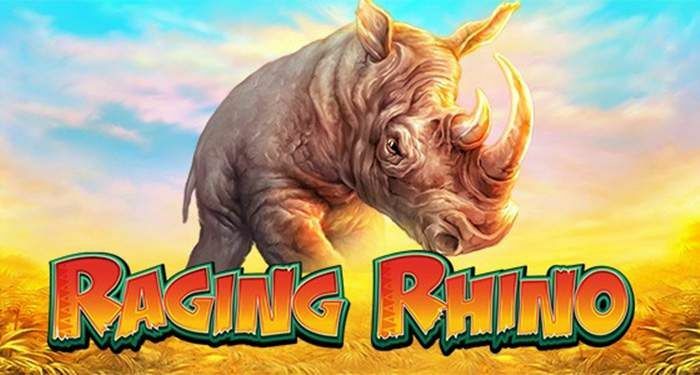 The slot machine called Raging Rhino is inspired by the wildlife of the African continent, as well as having multiple free spins, wild graphics and scatter graphics. In the Raging Rhino slot machine, the jackpot is up to twelve thousand credits expressed in Euros, which is quite impressive. Imagine winning and taking home twelve thousand Euros would be extremely remarkable. And this would be completely possible with more than four thousand ways to win. The Raging Rhino slot has a screen adaptable to mobile devices, therefore, it can be played on different smart cell phones, and it is being compatible with Mac devices by installing the Flash player. If you ever wanted to experience the thrill of a ride on the African continent, this Raging Rhino slot machine is the perfect opportunity to launch yourself into an adventure. The screen of this game shows a beautiful background landscape that lets you admire how beautiful the vastness of African lands can be. The numerous graphics can take a position in the wide reels; these graphics are in accordance with the African theme because it has different types of wild animals such as crocodiles, leopards, gorillas and without forgetting the rhinoceros. In addition to these animals also has graphics of trees and diamonds, poker cards regularly involved in slot games. Raging Rhino has the payment lines with which most slot machines are attached; being one of its most outstanding features is to give the player the opportunity to get different combinations between different graphics that are followed one another, here is when it offers 4096 different ways to win their players. The graphics of this Raging Rhino slot have a bright peculiarity; some blue and others gold show a shining and resplendent effect. Among them, the African tree graphic will take place only on reels number two, number three, number four and number five, never in the first or in the last. The African tree is the wild card and wild graphic that can substitute the other graphics, without including the dispersion chart, which is the diamond. The diamond as a scatter chart should fall on three reels as it rotates so that the player obtains a prize. This graphic can take place in any reel, regardless of which one falls after the turn, the important thing is that they fall close. The prizes are obtained after three to six diamond graphs fall. The Raging Rhino slot has a quite remarkable soundtrack because it has a quite fun touch that makes the players happy while they entertain themselves in the game. These sound effects are even more compelling when they are found in free spins bonuses; that’s when the soundtrack begins to play themes related to an even more African style. The Raging Rhino slot machine does not offer the free spins bonus, it can be said that you do not need a bonus to be able to get the free spins that go from five to fifty additional spins at the moment that two to six scatter diamond graphics fall into the reels after the turn. If during this free round some African tree graphic falls, the multiplier function of up to two or three times its value will be activated. If it is true that the Raging Rhino betting machine possesses the 4096 ways to pay you already mention and not the common payment lines in the slot games. These 4096 forms do not have the option of adjusting since they have a fixed characteristic, the bets range from 0.40 credits and amount to 80 credits when the multiplier option appears up to two hundred times the value per bet. In cases of major bets, six scatter diamonds can offer up to eighty thousand coins, this being the most incredible payment of the Raging Rhino slot machine. 80,000 credits? Is that even Possible? Raging Rhino as a slot game has the unusual ways to pay instead of the classic pay lines, it is true, and it also offers an extra spinning reel that helps players win victories more easily. The players are quite used to the common lines of payment and are not very sure if the new forms of payment are so comfortable because they trust fully in what is already known that brings the lines of payment. WMS Gaming has other slot games such as the Amazon Queen slot machine and the Egyptian riches slot machine. Raging Rhino proved to reach and maintain the standards of the great games of this company, offering very good payments and prizes without the need for bonuses, the four thousand ways of paying, in addition to the soundtrack with the additional effects related to the African jungle (although we must bear in mind that however interesting the effects of sounds may be in a certain part, there are people and players who do not find it pleasant or comfortable, because they cannot concentrate for the peculiar and thunderous that they can be; and how the slot games are designed to suit the tastes of each who, always available a button that deactivates the sound, and in this way can enjoy quietly the game without auditory distractions), the screen with large reels and extremely bright gold and blue graphics with a solid wallpaper also bright, which makes See the African savannah as if it was made of gold. Without forgetting the bottom board where the gains obtained throughout the game are revealed until now and is updated only in each turn that occurs, also containing a reset button. The same graphics are able to grant the free spins that everyone is looking for; if the player seeks to learn the combinations he only has to consult the table of the game, where he will easily find the combinations of graphics he needs to achieve to obtain the best prizes of all. Spend in the vast savannah among the most feared and feared animals of the entire African continent. With the Raging Rhino slot, it is impossible to let it pass. To play Raging Rhino you need a budget of a thousand credits, perhaps a little high for first-time players or without many possibilities to afford a few games in a slot game like this. Although if you play it in its free version, you do not need any money, in these versions you get to know the game a little more and get acquainted with the practice and time. And as a player, you should not worry, because the free version is exactly the same as what is available in different casinos in Las Vegas and other cities around the world. You just have to think about having fun and having a good time, after all, it is a game. The cover of the slot game gives a first appearance full of power and danger because the rhinoceros can be a very tame animal but do not forget that it is still wild and with a force worthy of fearing. Raging Rhino is considered an epic slot machine, to reduce the number of words. It is not surprising that it has come to cover so many portals and platforms.